I bought the cct. brds. for the Hiraga Le Monster over twenty years ago and populated them shortly after arrival. But that's where it stopped. 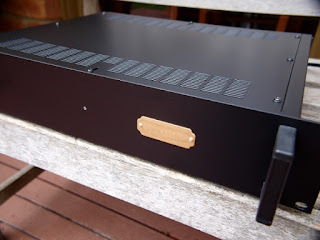 An enclosure I had designed for the amp was incomplete and thus the whole project stopped. 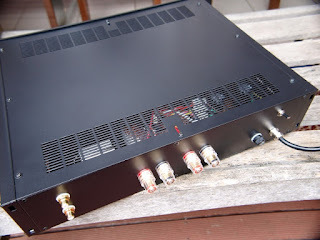 Using an off the shelf 19" 2U enclosure the amp is now complete. The PS uses a 160VAC 12-0-12 volt high current toroid with 80,000uf total of filtering\storage. Bias is 700mA with a 10A bridge and 4ohm\20W filter\limiting resistors. All wiring is Cat5 solid core twisted pair this includes most of the power wiring. No shielded cable is used and RCAs and speaker binding post are heavy duty and high grade gold plated. A internal 10A RFI\EMI power filter ensures clean power in the amp and the enclosure is earthed and fused. Not only does the amp look smart with an ash black stipple finish but sounds excellent. With only 8W of pure class A power efficient speakers only will deliver good volume levels. The amp has an extremely natural relaxed sound about it I've not heard from other amps. Being a DC amp bass is extended and treble clean with controlled sibilance. It is an amp which has to be heard to understand.